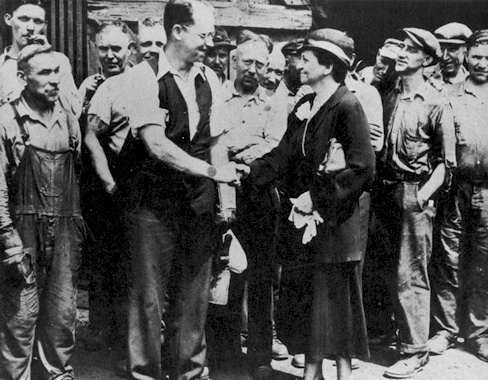 Secretary of Labor Frances Perkins shaking hands with steel workers in Homestead, Pennsylvania in July 1933. 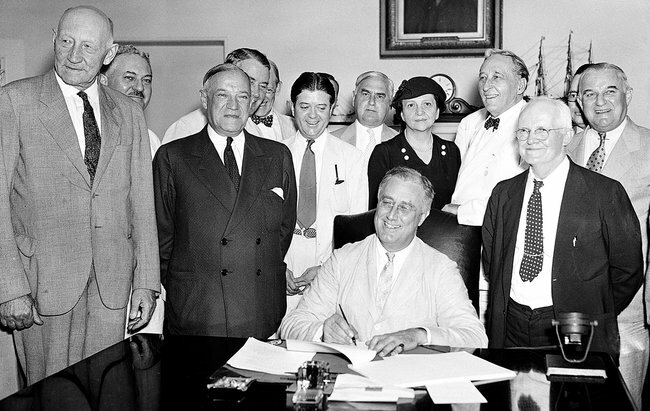 Perkins stands behind President Franklin Roosevelt as he signs the Social Security Act into law on August 14, 1935. A recent poll found that 63 percent of Americans support a federal minimum wage of $15-an-hour. Despite attacks from conservatives, Social Security is overwhelmingly popular. Most Americans take for granted the idea that employees shouldn't be forced to work more than 8 hours a day without overtime pay and that the government should protect workers from unsafe and unhealthy work places. Surveys show that a majority of Americans believe unions are good for the country. A significant majority of working people support the right of workers to unionize. Once considered radical, these ideas are now considered common sense. And noone was more instrumental in shaping these laws than Frances Perkins, a progressive activist who became President Franklin D. Roosevelt's Secretary of Labor. Perkins, who died 50 years ago this month, is one of our nation's greatest heroines. Her remarkable life should inspire us to continue the battles she fought. Many of the issues she worked on -- including wage theft, discrimination against women workers and the rights of immigrant workers -- remain problems today. Anyone who fights for social justice stands on her shoulders. Born in 1880, Perkins grew up in a comfortable middle-class Republican family in Worcester, Massachusetts. At Mount Holyoke College, she was deeply influenced by an economic history course that required her to visit factories in the nearby industrial city of Holyoke and interview workers about their working conditions. She was also affected by reading How the Other Half Lives, Jacob Riis's exposé of New York's slums. In February 1902, during her senior year, Perkins attended a campus talk by Florence Kelley, head of the National Consumers League. Perkins was impressed by Kelley's fiery speech, her combination of radicalism and pragmatism, and her nonconformist lifestyle as a divorced woman with three children working to save the world. Eventually, Kelley, who also came from a middle-class Republican family, became Perkins's role model and mentor. After graduation, Perkins took a series of teaching positions in Connecticut, Massachusetts, and Chicago. In her spare time, she volunteered at settlement houses in each city, including Hull House. One of her duties was to try to collect wages for workers who had been cheated by their employers, a responsibility that took her into the homes of the city's poorest residents. In Chicago, she gained more firsthand exposure to dangerous factory conditions and slum housing. In 1907, she took a $50-a-month job with the Philadelphia Research and Protection Association, a Progressive Era reform group. Backed by church and philanthropic groups, the group helped immigrant white girls from Europe and African-American girls from southern states who were then arriving in Philadelphia in great numbers, hoping to find work, but often preyed upon or robbed. Perkins exposed the exploitation of young immigrant and African American women by bogus employment agencies that promised good jobs but lured them into prostitution. She applied for jobs herself to uncover the agencies' practices. She visited fleabag lodging houses and terrible factories, supplying information to the press and city officials. Perkins moved to New York in 1909 to study at Columbia University. The city was bursting with protest and with a growing progressive movement that included union activists, clergy, muckraking journalists, socialists and even upper-class women (including the wives of some of New York's wealthiest men), feminists who cared about the problems of working women. After earning her master's degree in economics and sociology in 1910, Perkins spent the next two years as head of the New York Consumers League. In that capacity, she conducted studies of unsafe and unsanitary workplaces, such as cellar bakeries, that exploited women and children, forcing them to work in dangerous conditions. She became an expert in workplace dangers and firetraps. Collaborating closely with Kelley, she lobbied the state legislature for a bill limiting the workweek for women and children to 54 hours. She also became active in the women's suffrage movement, marching in suffrage parades and giving street-corner speeches. On March 25, 1911, Perkins was having afternoon tea with her friend Margaret Morgan Norrie, a wealthy New Yorker descended from two signatories to the Declaration of Independence. They met at Norrie's elegant redbrick townhouse overlooking Washington Square Park in Greenwich Village. But their conversation was interrupted by the sound of fire engine bells. A big fire had erupted on the other side of the square. From the townhouse, they could see flames engulfing the top floors of a ten-story building. Holding up her long skirt, the 30-year-old Perkins ran to the fire scene and realized that the building housed the Triangle Shirtwaist Company, one of the city's largest garment factories, which employed immigrant girls in miserable, overcrowded conditions. Perkins saw workers huddled on the top floors unable to escape because the exit doors had been locked and there were no fire escapes. She saw other workers hanging from the windows by their hands, clinging desperately. She noticed that the city fire trucks' ladders could not reach the top floors, and she witnessed the awful sight of workers jumping or falling to their deaths from the eighth and ninth floors. In total, 146 workers, most of them young immigrant women, died in the Triangle Fire. The experience of witnessing that tragedy, Perkins later explained, "seared on my mind as well as my heart -- a never-to-be-forgotten reminder of why I had to spend my life fighting conditions that could permit such a tragedy." We used to make it our business to take Al Smith, the East Side boy, to see the women, thousands of them, coming off the ten-hour night shift on the rope walks in Auburn. We made sure that Robert Wagner personally crawled through the tiny hole in the wall that gave egress to a steep iron ladder covered with ice and ending 12 feet from the ground, which was euphemistically labeled "Fire Escape" in many factories. We saw to it that the austere legislative members of the Commission got up at dawn and drove with us for an unannounced visit to a Cattaraugus County cannery and that they saw with their own eyes the little children, not adolescents, but 5, 6, and 7-year olds, snipping beans and shelling peas. We made sure that they saw the machinery that would scalp a girl or cut off a man's arm. Perkins recognized the importance of employees having their own organizations to advance workers rights. She also understood the necessity of forging coalitions to push for progressive legislation. Many of Perkins's upper-class friends provided financial and political support for the causes she worked on. She also forged friendships with politicians, even those she disagreed with, because she knew they could someday be helpful in passing reform legislation. One of those politicians was Smith, the state assemblyman who surprised many New Yorkers by successfully pushing for factory reforms after the Triangle Fire. After he was elected governor in 1918, Smith appointed Perkins to the State Industrial Commission and named her its chair in 1926. Three years later, Franklin Roosevelt (who served as New York governor from 1929-1932), named her the state's industrial commissioner. In that capacity, she visited the United Kingdom to see if that country's unemployment insurance and old-age assistance laws could be adopted in the United States. She expanded factory investigations, reduced the work week for women to forty-eight hours, and championed state minimum wage and unemployment insurance laws. 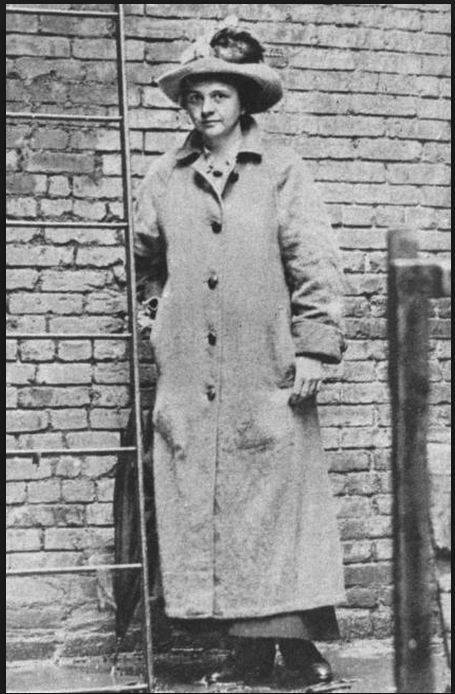 Perkins stands next to a fire escape as part of her investigation of working conditions for the NY Factory Investigating Commission in around 1912, following the Triangle Fire. As Secretary of Labor in 1940, Perkins descends into a mine shaft in Missouri to investigate working conditions. 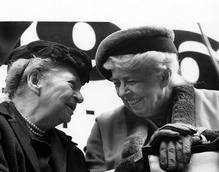 Perkins with Eleanor Roosevelt in 1961 at the 50th anniversary commemoration of the Triangle Fire. After FDR's victory in the 1932 presidential election, many progressives, including his wife Eleanor and Jane Addams, urged him to appoint Perkins his Secretary of Labor, but many Americans doubted that a woman could handle such a demanding job. Even Al Smith, her former boss and admirer, remarked that "men will take advice from a woman, but it is hard for them to take orders from a woman." The first woman appointed to the Cabinet, proved her opponents wrong. She served as Secretary of Labor from 1933 to 1945. She and Interior Secretary Harold Ickes were the only original members of FDR's cabinet to serve for his entire presidency. Perkins drew on New York State's experience as the model for new federal programs. She was determined to create a safety net for a Depression-scarred society and to use the government's power to create jobs for the jobless. 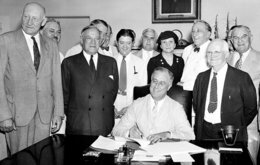 She helped secure a remarkable array of benefits for American workers, including jobs program (the Civilian Conservation Corps, the Public Works Administration and its successor the Federal Works Agency, and the National Industrial Recovery Act). 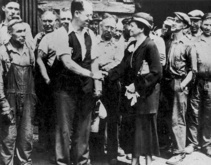 Within FDR's inner circle, she was the strongest proponent of the landmark National Labor Relations Act, sponsored by Senator Robert Wagner (the same politician she had worked with after the Triangle Fire). Passed in 1935, it gave workers the right to unionize. She led the fight for the 1935 Social Security Act, which established unemployment benefits, pensions for elderly Americans and financial aid for the poorest Americans. She was also the prime mover within the Cabinet for the Fair Labor Standards Act, passed in 1938, which created a federal minimum wage, established a 40-hour work week, guaranteed time-and-a-half for overtime in certain jobs and prohibited most employment of minors in "oppressive child labor." Perkins excelled at the "inside/outside" game. She was one of a handful of FDR's close inner circle advisers with regular access to the president. FDR trusted Perkins's political judgment and her lobbying skills. She was effective at out-maneuvering and out-arguing some of the president's more conservative advisers. She was also adept at working with labor and consumer groups, advising them on which Congress members to lobby, what arguments to make, and when to resort to protest and rallies to draw attention to issues and help push legislation over the finish line. Perkins consistently supported workers' right to organize unions and to pressure employers. For example, in May 1934 about 130,000 San Francisco workers -- printers, streetcar operators, bakery-wagon drivers and others -- stayed home from work to show their solidarity with the city's longshoremen's union, led by Harry Bridges, who were on strike against the big shipping companies. The city's business leaders, as well as state and city officials, implored Secretary of State Cordell Hull, who was standing in for FDR while the president was out of the country, to mobilize federal troops to quell the general strike. Hull agreed with them. FDR's attorney general, Homer Cummings, told Perkins that a general strike was tantamount to an attempt to overthrow the government. The unflappable Perkins rushed to a naval communications facility to get a message to FDR before he heard from Hull or Cummings. He not only sided with Perkins -- saying the strike should be settled through negotiations, not military force -- but he also made it clear to the other cabinet members that she was in charge of handling the crisis. As Perkins predicted, the workers returned to work within two days, the employers and the union negotiated their differences, and the workers won better wages, working conditions, and a union-sponsored hiring hall. As Perkins said, "I have come to the conclusion that the Department of Labor should be the Department for Labor, and that we should render service to working people." During the Depression, 6.5 million people were 65 or over. Few had money set aside for old age. Many who had put away a nest egg for retirement saw it disappear when the economy crashed. Only about 300,000 Americans had public pensions, 150,000 had pensions from private employers or unions, and 700,000 had federal relief. The rest were on their own. "She nagged the president to get it started. 'It is probably our only chance in twenty-five years to get a bill like this,' she told Roosevelt." She knew that the dire conditions of the Great Depression were the only hope for passing something so radical: "Nothing else would have bumped the American people into social security except something so shocking, so terrifying, as that depression," Perkins later said. "In a meeting with Roosevelt present, she went around the table and extracted from each of the major members of her committee a pledge to support the program being prepared by the committee. Publicly obligated, they could not back down later." Frances later called committee leaders to her home, "led them into the dining room, placed a large bottle of Scotch on the table, and told them no one would leave until the work was done," according to Downey. With Perkins at the helm, they crafted a bill. She smartly tied together several key ideas. Unemployment insurance would tide over the jobless workers who were the primary source of support to children. Social Security would provide old people with pensions so they could retire without falling into desperate poverty. She also included financial assistance for the handicapped (which today is called disability insurance) and for widowed women with children, because many women earned so little money that when their husbands died they often had to put their children to work or put them in orphanages. "Perkins hit the roof. 'That man, that man!' she muttered. She ripped over to the White House. The next day, FDR told the press conference that he was 'tremendously' for the bill." FDR explained that his plan would provide "security against the hazards and vicissitudes of life." But conservatives and business lobby groups, and many newspaper editorial writers, continued to oppose the bill. A March 30, 1935 headline in the New York Times declared "Hopes Are Fading for Security Bill." But Perkins would not give up. She recruited 50 prominent people to sign a letter urging Congress to pass the bill. With unions and other progressive groups weighing in, too, the House, and then the Senate, passed the bill. FDR signed the bill into law on August 14, 1935. Perkins said it was "one of the most forward-looking pieces of legislation in the interest of wage earners." Not surprisingly, Perkins became a target of business and conservative groups, who hated public works and social net programs, the minimum wage, and, more than anything, labor unions. One of their staunchest allies in Congress, Martin Dies, headed the House Un-American Activities Committee (HUAC), which accused Perkins of supporting communists. She had refused to support efforts to deport Bridges, the West Coast longshoremen's union leader, whom the shipping industry detested. Another right-wing Congressman, J. Parnell Thomas, introduced a motion to impeach her. Her opponents resorted to various lies and dirty tricks, accusing her of having an affair with Bridges, of being a lesbian, and of being born a Russian Jew. FDR refused to fire Perkins, although he did little to defend her from the right-wing attacks. Eventually, HUAC unanimously concluded that the impeachment charges were not warranted. Even so, 10 Republicans issued a minority report saying she should be censured. After FDR died in 1945, Perkins resigned from her position as labor secretary to head the U.S. delegation to the International Labor Organization conference in Paris. President Harry S. Truman subsequently appointed her to the Civil Service Commission, a job she held through 1953. In the last years of her life, she taught at Cornell University's School of Industrial and Labor Relations. In 1962, at the age of 80 she gave a memorable speech to the employees of the Social Security Administration on "The Roots of Social Security," which is still worth reading. The headquarters of the United States Department of Labor in Washington, D.C. is called the Frances Perkins Building. But it is likely that many people who pass by that edifice have no idea who Perkins was. Adam Cohen, Nothing to Fear: FDR's Inner Circle and the Hundred Days That Created Modern America. New York: Penguin Press, 2009. Kirstin Downey, The Woman Behind the New Deal: Frances Perkins, FDR's Secretary of Labor and His Moral Conscience. New York: Doubleday, 2009. Richard Greenwald, The Triangle Fire, the Protocols of Peace, and Industrial Democracy in Progressive Era New York. Philadelphia: Temple University Press, 2005. Frances Perkins, The Roosevelt I Knew. New York: Viking Press, 1946. David Von Drehle, Triangle: The Fire That Changed America. New York: Grove Press, 2003. Triangle: Remembering the Fire, a documentary film directed by Daphne Pinkerson. 2011. Peter Dreier is E.P. Clapp Distinguished Professor of Politics and chair of the Urban & Environmental Policy Department at Occidental College. His most recent book is The 100 Greatest Americans of the 20th Century: A Social Justice Hall of Fame. Frances Perkins is one of the people profiled in that book.